You may remember a post from back in June, where I discussed our decision to redecorate our very unattractive bedroom. Since I am the epitome of indecisive, this project has taken a little longer than either of us expected; however, I’m pretty certain that most of the details have been nailed down – maybe. If you follow me on Pinterest, you may have seen my random bedroom labeled pins popping up sporadically in your feed. One of the biggest decisions that we faced was the paint. I knew I wanted the room to be gray, because the one design element I was set on, was a gray and mustard color palette. After staring and analyzing about 8 color swatches striped across our walls I finally decided on a matte gray paint from Benjamin Moore. Brian and his friend, Dave removed layer upon layer of slightly hideous wallpaper and painted the bedroom and bathroom a snazzy new, modern color. Then came the bedding. I think I filled and removed items from my West Elm cart about 8-10 times before actually submitting my order. But in the end, we decided on a Pintuck Duvet Cover in the color slate. It’s a lovely textured duvet that adds a bit of dimension to our very simple and modern bed frame. We moved on to curtains and some very basic accessories. I knew I wanted the curtains to be dark and somewhat thick. The sun blazes through our bedroom windows with all kinds of fury, so I wanted to be able to block that out on the odd occasion that we actually sleep in past 8. We chose velvet grommet window panels from West Elm in the color Iron. Yesterday was spent hanging floating shelves, some artwork and a giant mirror – all of which are excellent ways to quickly initiate an argument. When you mix an incredibly detail-obsessed woman with, well, a man who has football to watch – conflict is certain to arise. But I decided to take the route of complete and total annoyance until he fixed the mirror that was exactly 2.3 inches off! I think I had the right to pester, don’t you? I’m now on the hunt for throw pillows, a funky corner chair, more artwork and mustardy lamps, so if you have any ideas, please leave them in the comment section below. I’ll be updating again with photos of the finished project which at this pace I’ll have done by February. Just kidding, I am motivated to wrap up this project by the end of the month, so we can start on the living room. 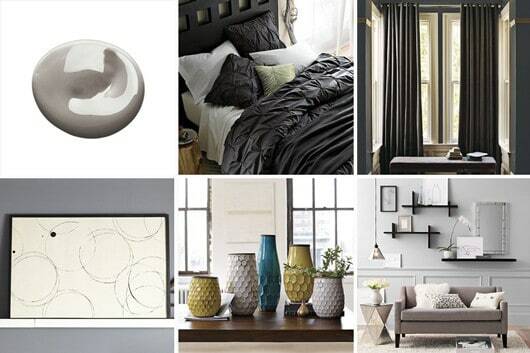 All photos from West Elm. Her pillow covers are really reasonable and some seem to have the feel that you are going for. Best of luck. Can’t wait to see the finished product! You are my new favorite person! Thanks so much for links – LOVING those pillow covers! THANK YOU! Anytime I need something unique, I tend to turn to the etsy community. There is so much talent and while I love Restoration Hardware, West Elm and Crate & Barrel, it is always nice to support smaller businesses. Wow – This is gonna be great! The grey/mustard is a new trend I’m seeing. I have a friend getting married and that’s their colors. If you’re willing to hunt for fun room accessories it’s definitely worth checking out! I painted my sisters bedroom and bathroom last year (eggplant and grey) We were never able to find a grey bedspread that we liked. Can’t wait to show her this one. your bedroom choices are fabulous! also…crate & barrel as well as cb2 have great stuff! happy hunting! Love the choice of color pallet Jamie. It’s soothing and warm and relaxing. Just found you on Pinterest (a total addiction of mine) and followed several of your boards. If we ever land this house then I’ll finally have a place of my own to decorate any way I like.
. I think mustard and grey are smashing together and I’m dying to paint a striped wall horizontally somewhere with that scheme.Your picks are chic and fresh. This is funny as far as timing that you put your decor here as I’ve been on Pinterest the whole weekend looking at designs to do some redoing in our home.That has led me to several amazing design blogs. Go to Centsational and follow links from there for wonderful ideas. Or go to Pinterest if you dont’ already know about it. You probably do, as I pin your recipes all the time. I shop at West Elm all the time. If you get lucky as i have twice, you walk in to a 75% off floor model sale. That is how I have 11 of their dining and bar chairs for around $500. Pillows can some times be found at TJ Max, but also look at Target and keep going back to West Elm. (You buy the pillow inserts separately) and then can keep changing up with new pillow covers as your mood or season changes). Can’t wait to see it all together. I read with some joy the comment about the mirror. I am so with you sister…funny how those GLARING discrepancies are so invisible to others! But I know you well enough and I’m sure Brian does…to just do it. Progress looks great and has me thinking I should spruce up my bedroom space. I like it but it’s been awhile and every few years something new just makes the whole room fresh. I really need to approach my house projects like you have – work on a room until it’s complete. I’m the type that will see something, like it, buy it, then figure out what room it would look best in. I have all of these incomplete rooms all over the house! They have beautiful lamps and imcan get you the designer price. Were not high end but moderate price point. When I move, I’m re-doing our bedroom in slate and mustard!